Where Do Wild Leeks Grow? Wild violets are often among first flowers to bloom in the spring. They are a perennial, coming back stronger and more plentiful every year. If you are not a fan of these wild beauties, you will have to aggressively work to rid them from your yard. Dig up the plant in the spring with your hand trowel. There will be a rhizome below the soil that will continue to grow and produce new plants until you remove it. Some of the rhizomes can clump together and form mats underground that will crowd out any other plants. Remove every one you can find or they will come back, vigorously. Watch for any signs of the little leaves and spray them each individually with a wide-leaf herbicide. It usually takes a week to work. Typically, the chemical should be applied midday, after dew has dried. Cover the area with a layer of landscape fabric if its heavily invested. Pile on a few inches of soil or mulch to suffocate the violets. If any little leaves make their way up, spray them with herbicide again. Plant your garden plants as usual. 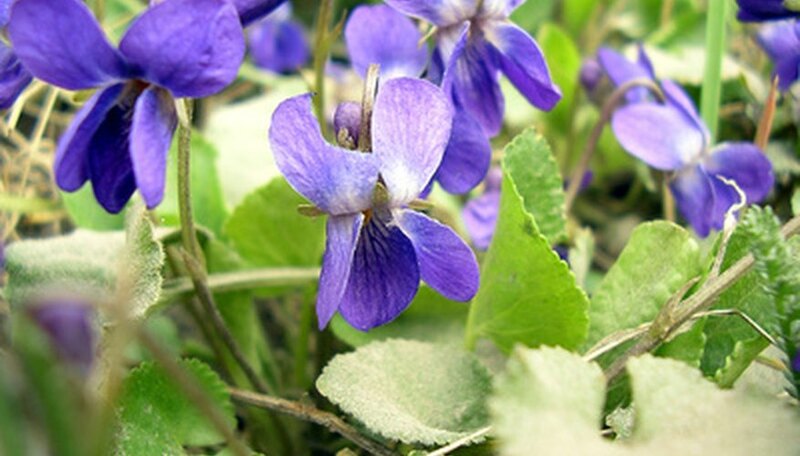 Native wild violets include the blue violet which has heart-shaped leaves; the bird’s foot violet which has leaves in a claw shape; the downy yellow violet which has hairy leaves; and the Confederate violet, so called because its grayish-white flower resembles the blue of Confederate uniforms. The violet flower has two petals at the top, two at the side, and one striped petal at the bottom. The stripes on the lowest petal are like a “landing pad” for bees to guide them into the heart of the flower for pollination. Most varieties of the wild violet have no odor; its European cousin Viola odorata is sweet-smelling and frequently used in the manufacture of perfume. Another relative, the pansy, is also fragrant and commonly used as a bedding plant. The flower of the violet is edible and can be used as a garnish, provided it has not been treated with any herbicide. The violet had the folk name “heal-all” and contains salicylic acid, a pain-killing ingredient in aspirin. The violet is sometimes considered a pesky weed because it can be very difficult to eradicate in a lawn. It has a dense system of roots and spreads both underground and by seeding. Wear gloves to protect the hands from all the thorns. Long sleeve shirts and pants should be worn as well. Protective eye wear keeps branches from whipping around and damaging the eyes during removal. Prune the wild rose bush down to the top of the root ball. This may take some time depending on how large the wild rose bush has been allowed to grow. Dig out the root ball and make sure to get all the runners. Canes, or branches, often branch off and start another section of roots. If these are not removed when the original plant is taken out, they will start growing another wild rose bush. Tie the canes together in bundles to keep them contained. Smaller bundles are easier to manage than larger ones. Contain the root balls with plastic bags or newspapers. Even the smallest roots can send out feelers and regrow another wild rose bush. Discard the root ball and branches by burning, if applicable. If you can not burn the wild rose bush, bundle up the branches with the root ball and place in a lawn and leaf bag for trash disposal. Do not place in the compost pile because the wild rose bush will find a way to reroot its self. Dig the wild violet plants from the lawn using the shovel. Remove the plant from the area and dispose of through composting. 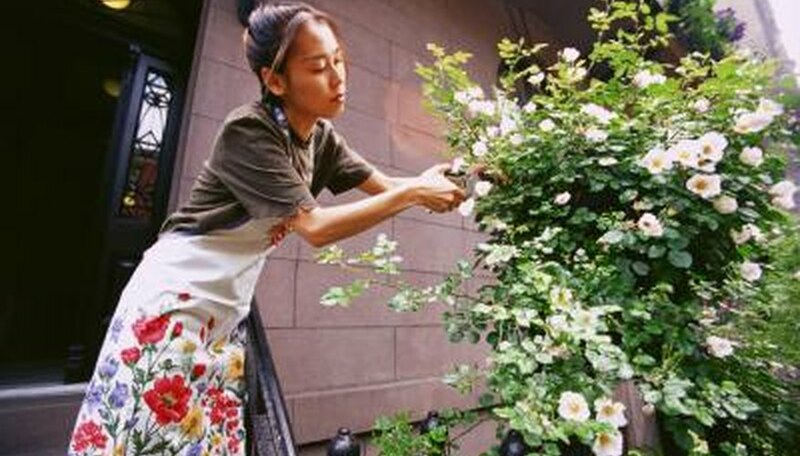 Pull the plants by hand when adequate moisture exists from rainfall. Keep the removed plants isolated by composting. Apply the herbicide triclopyr combined with clopyralid. According to Ohio State University, this combination of herbicides has the highest success rates through repeated spray applications. The chemical is found at local home and garden stores under various trade names. Mix the herbicide according to label directions. Spray on the affected areas of the lawn between late April and mid-June or early September to mid-October. Repeat herbicide applications as required. Choose a planting site with moist, fertile soil and partial to full shade. If growing wild violet from seeds, sow them anytime from spring to fall but be aware it may take up to five years to see blooms. If using preexisting plants, plant in early spring, about 4-6 weeks before the last frost. Water but don't soak the planting site and expect blooms from March to June. If placed in a moist, shady area, established wild violet plants need to be watered only when the weather is dry. Select a calm and sunny day in the spring when the wild violets are growing actively. Choose a day with temperatures approximately 70 degrees F when you do not expect rain within two hours of the herbicide application. Spray the herbicide onto the wild violet plants, saturating the leaves, blossoms and stems thoroughly. Wait for at least two hours before watering the lawn, or you may wash the herbicide away. Monitor the effects of the herbicide application over the next six weeks. If the wild violets do not show significant deterioration and yellowing, reapply the herbicide a second time. Wild leeks grow in the eastern regions of North America. In the United States, they grow in most states located to the east of North Dakota, South Dakota, Iowa, Missouri, Oklahoma and Alabama. A group of wild leek plants usually form scattered patches in the spring. They mainly grow in the forests or deep woods, although sometimes some appear in the city. No method exists to cultivate wild leeks and professional foragers pick the wild plants in the woods to sell at markets. 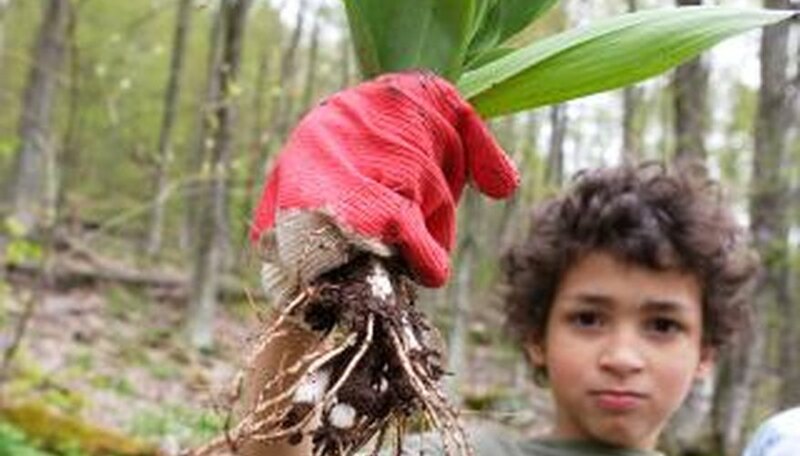 Because wild leeks reproduce by extending their root system, foragers must only pick a few plants from each patch. Apply a herbicide containing dicamba or triclopyr, recommends Ohio State University. Prepare to spray the herbicide in the spring and fall. This controls early wild violet growth and curbs reproduction in the fall. Spray the herbicide directly onto the plants, spraying as close as possible to prevent the herbicide from spreading. If using granule herbicide, slightly wet the plants before applying. Wear protective clothing and eyewear when applying the herbicide. Follow all directions on the herbicide packaging. Examine the flowers. Wild white roses come in clusters, with each flower having five petals and numerous stamens, the organs containing pollen. Colors can range from white to dark rose. Notice the leaves. Wild white roses have small, oval leaves that alternate on the stem, have teeth on the edges, and have shiny surfaces. Observe the stems. Wild white roses have gray or reddish-brown stems containing small curved or straight thorns. New buds appear shiny and red on the stem. Note the height of the shrub. Wild white rose bushes grow from 2 to 5 feet tall.